I inherited this magnet from my old boss when he left our former company. 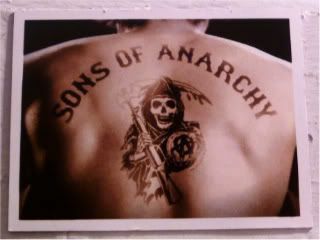 He got it from a mutual friend and colleague of ours, who saw it on my cube wall and said, "Heeeeey! I gave him that magnet!" Ooops. 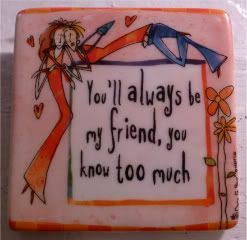 They always say that friends are the people who know you, and who like you anyway. I'd venture to say that they're also the people who not only know you, but know what you've done, who you've done it with, who you've done it to, no holds barred. I think those people, and you know who you are (and what I've done, who I've done it with and who I've done it to, no holds barred), are awesome. It's raining like crazy outside in NYC today, and like a dummy, I'm wearing sandals. 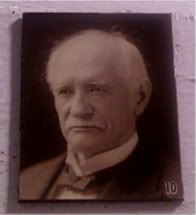 So when I saw this Sargent in my magnets photobucket cache, I knew I had to use it. Saw this piece at the Corcoran's Sargent and the Sea exhibition earlier this year. I've never been a huge fan of Sargent, but I really dug this show because of his sketches/sketchbooks on display. 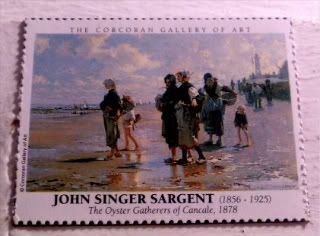 There's a whole background here at the JSS gallery about this painting, and how it's the women of Cancale doing the oyster gathering, while the men are away. You can see here all the generations heading out for the hunt (the gather?). It does remind me of all the clamming we did when we were little - we'd head out to the marshes, in either North or South Carolina, and go digging for clams. What sticks most in my head (pun intended), though, is the loud sucking sound that came from pulling our feet out of each hole we'd made in the sludgey mud. Lotta effort, given that we kids weren't big clam fans. For a kid, that's pretty much playing like a pig in slop, fun as hell, and of course, dirty as hell, too. Wonder if if I'd dig it now. 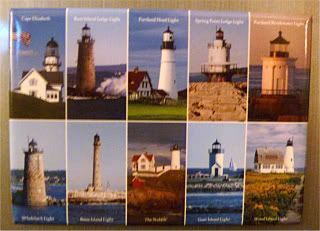 My sister brought this magnet back from her trip to her hub's family reunion in Florida, mostly because I misunderstood and thought she saw James Van Der Beek at the beach. I couldn't figure out why Dawson Leery would be near BIL's family reunion. 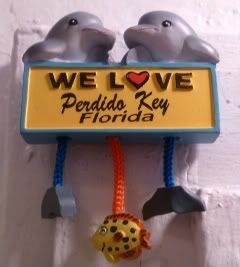 Turns out they saw dolphins at the beach. Yeah. Well, the audiologist did mention that if I think I'm missing too much, it's time to get hearing aids. I picked it for today because I made my train ride today, so I'm training my way back up north, and whiling away the hours by watching the rest of Invasion, that short-lived alien sci-fi show produced by Shaun Cassidy, starring cuteboy Eddie Cibrian. It's set in Homestead, FL, after a big hurricane where strange lights in the water began to take over the townspeople, and how two families try to get through the aftermath. There's almost no reason to finish watching the series, since clearly, I'll never get an ending from it. But, cute is, as cute does, and who can resist a little Eddie? 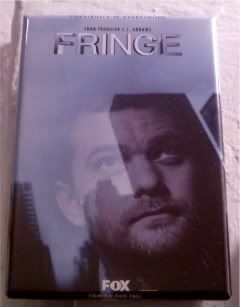 He's actually the only reason I own the DVD set. Although, Invasion came out on ABC, when CBS put out Threshold, the other "aliens taking over the world" show...which I also own, because of cuteboys on it. Nah, you can't tell me you're surprised that my TV DVD collection includes a sad little section of short-lived series that no one ever watched but me and the grannies. Or that the majority of them only live on my DVD shelves because of one or more cuteboys on those shows. But images of old buildings in their former glory are always cool to see. 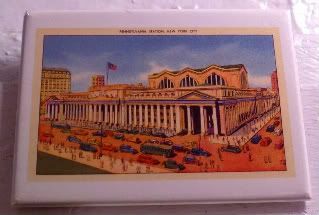 I magnetblogged Penn Station a couple of years ago - and looking at this magnet, it's still so very odd to know that people just went out and demolished such a grand building. Penn Station is still there, of course - the original station celebrated its 100th anniversary this year. But it's a much lesser version of itself. Still busy as ever, it's used by Amtrak, LIRR, NJ Transit, and the MTA. There are even plans constantly afoot to improve it as the Moynihan Station, but who knows if they can restore the past. I picked the station today, only because as I type this, I should actually be walking through the halls Penn on my way home. Except that I missed my train, having overslept this morning. Thank goodness Amtrak tickets are much easier to switch than plane tickets! 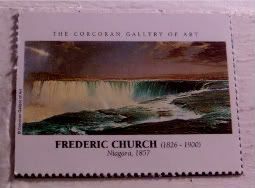 Niagara is one of the few paintings I've seen that do justice to the actual waterfalls. Of course, it's seven-feet-wide, so that probably helped a bit. Plus, in the deafening quiet of the gallery, you can almost hear the pounding of the falls on the rocks below. Very cool. The giant piece is overwhelming and amazing, and is likely the painting that solidified Church's place in art history. 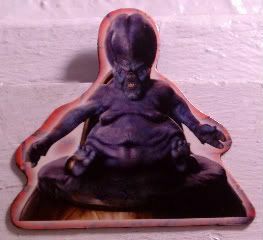 Dudes, I haven't a clue where this magnet came from. 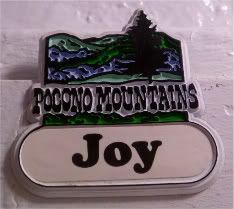 I can't figure, is where I went in the Poconos that would have a generic mountains magnet. Why can't I get Kokomo out of my head? 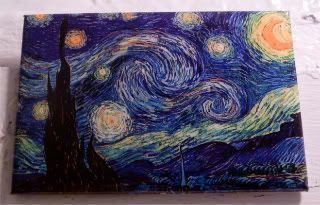 My friend bought this magnet for me, which is sad because the darn Cloisters are just a bus/train away from me. Even sadder, given how often I'm darkening the halls of the Met, the parent museum of the Cloisters. 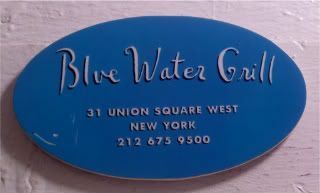 It's one of those New York places that I've been saving, for dcsister to finally do it with me. The thing is, we've been trying to go for seriously, almost twenty years. Every time we think we're gonna visit it, we end up choosing something else in town, or we somehow talk ourselves out of the long trek uptown. But, at some point, we have to go because I really do want to see the Unicorn tapestries from the 1400/1500s. 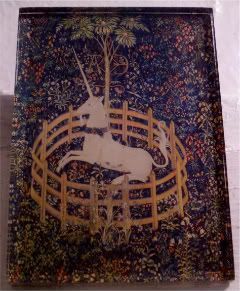 I love this Unicorn in Captivity tapestry, because everyone has that elusive thing they're trying to catch. Whether it's that dream job, or a bear, or whatever, everyone can relate to trying to catch a unicorn. And, hopefully, this year, I'll be able to "catch" both. And maybe even visit the Cloisters, to boot! And so, the chronicles of "Let's visit someplace of import, but not really know anything about it..." continues. 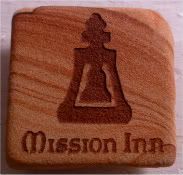 One of my favorite aunts and uncles brought me to see the historic Mission Inn in Riverside several years ago. We wandered around the hotel lobby for an hour or two, and saw some really cool stuff. But, here's just a sampling of what I missed. Le sigh. Apparently, not one, but TEN U.S. presidents traveled through here. They have a giant chair in the lobby, especially made for Taft, after Frank Miller (no, not that one, this one, the "Master of the Inn,") heard the rumor about Taft getting stuck in his bathtub. The Presidential Lounge that used to be where the presidents stayed, but now is a cool little...lounge. They have about 400 bells scattered throughout the grounds - they used to collect them. Including one that Louis Comfort Tiffany tried to buy...with a blank check! Ack. It always makes me crazy when I find out I've missed out on something, or twelve. Of course, now that means I have to go back, and actually take a docent tour and go to the museum! 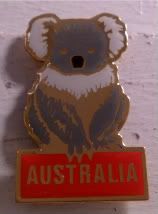 My friend brought this koala bear back for me from her trip down unda. Figured it works for today, being as there's an Australian couple sitting across the aisle from me on my Amtrak train ride down to NC. I take this train pretty regularly, but this morning, for some reason, I figured I better double-check the departure time - I couldn't remember if it was 7 or 7:15. Either way would have meant leaving the house at 6, getting ready (and packing, of course) at 5. But what ensued was 35 fresh minutes of hell, when in the quiet of the room, I yelled out, When the hell did the Carolinian start running at 6:15!!? So as I was repacking my bags that I threw everything into, this lovely Australian couple asked me if I take this train regularly, and which side did I recommend. I told them both sides. I went further and told them I loved this train route, taking this mode of transpo more than I'd ever take the plane, and I warned them that it was a lonnnnng train ride. Some 12 hours later, with our final destinations still hours away, we're just now pulling out of Rocky Mount, and the Australian couple with the cool Ozzie accents are like, I can't believe you like this way of traveling! Eh, of course I still do! You just gotta roll with it, even as you're stuck on a hot train, listening to several different conversations about kids and grandkids, and cell phone conversations that loudly start with, "I'm stuck! In Rocky Top! Rocky Mountain? Rockyyyy Mount." There's a woman from Solvang - hey! I've been there! It's a little Danish community with a windwill over a bakery in California. There's the 91-year-old hub with his young 88-year-old wife who (while they're still young) have finally decided to pack up the house and sell it and move to be close to the kids. There's the loud woman in the back having a conversation with the loud woman up front who takes this train all the time and has never been stuck for this long! But, it's the Oz Couple who fascinate me. They take a good 3-month break every year to come visit their daughter and grandkids in the States, and for the past few years, they've managed to rack up visits to about 40 US states. They're doing better than most Americans! And this is coming from the couple who declared, Oh, America was never a travel destination for us, and yet, here we are. Stuck on Big Rock Candy Mountain. I've never seen an episode of Hoarders - I don't even know what channel it's on. Just the commercials scare the bejeepers out of me. How do people live with all that stuff? Then it struck me a bit dumbfounded this weekend that I might have the makings of a hoarder. No, no, stop backing away. I said makings of. I'm a Taurus, I'm supposed to like having stuff. The mere possession of stuff makes me happy. For example, if I notice I'm missing something from my wardrobe, next thing I know, I have 10 pairs of capris. It's not like I buy in bulk or anything, it just sticks in my head that I don't have something, and I keep picking up the same thing. If you go even further back to my high school days, that old Loveswept series I worked on? Close to a thousand books in the series...my bookcase in my old room at home is missing maybe 200 of them. It's scary how many possessions people own. During the last few days, I've been doing a giant clear-out of my apartment, getting rid of clothes (8 giant bags! ), books (remind me to quit my paperbackswap account!) and in general, just getting rid of clutter. 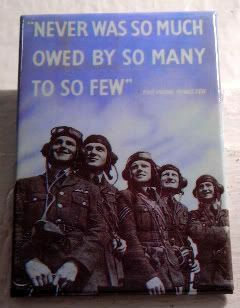 And I have a ton of it. All in a very small, supertiny NYC studio. Already, I feel a ton better from getting rid of all the useless crap in my apartment. After all, you can't take it with you when you go. 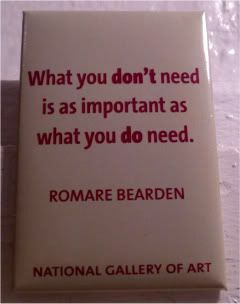 Anyway, I figured this Bearden magnet was apropos to the occasion, as I try and figure out the stuff I really need, the stuff I really don't, and the stuff I really just like to own. Just don't touch my magnets, and we're good. Hey. 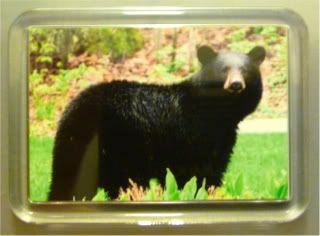 How about I have a magnet with quote from a guy who has a den for bears? C'mon, that's awesome! What better magnet to use for a Doctor Who marathon than the Moxx of Balhoon. I started yesterday morning with Rose and Nine, and have been making my way through slowly but surely. As I type this, I'm on Love & Monsters and Ten. It's my own gift to myself this very busy weekend. Well, I won't offer you bodily salivas as felicitations upon this historical happenstance, but damn, this exchange of ambassadorial gifts scene never fails to crack me up. I could watch it for hours. Or at least five or six times in a row just now, while I figured out what the quicktalking Moxx actually said. Cuz I was just gonna say, here's some spit. This piece is currently on view at the MoMA, and is superpretty. Of course, it's superpretty, it's a Monet. 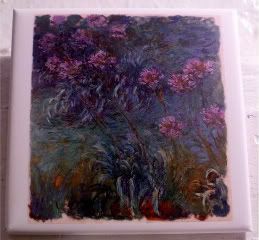 According to the MoMA description, this lily plant, Agapanthus, was part of Monet's famed Giverny gardens. Love that place. Last week, I was pressed for why I love the Impressionists so much, and it was deduced that I love Impressionist work because it's softer and more romantic. It's not cutting edge. It's not trying to make a whole lot of social statement. It's not trying to change the world. It's there to hang on a wall, look pretty and be admired. I suppose that one could argue that the artists of the day were definitely cutting edge back then, that some of their work did stand as a social statement, and that they were trying to change the world. And it's only the passage of time that has rendered their avant-garde work part of the establishment. One thing I have definitely been thinking about lately is whether or not I'm liking art for what it's trying to say, or for what it makes me feel. Whether or not I like art for the technique and skill behind the piece, or if my favorites are based on my favorite color palettes of blues and greens. Eh. It's the same old story with me. I like what I like, and I try not to look too hard into why I like it. After all, it's there to be hung up on a wall, look pretty, and be admired! Done! 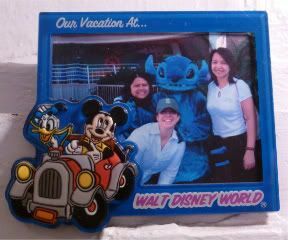 This magnet totally fits my fun day today, running all over town. Hey, did ya'll know that's what people do when they're not chained to a desk? They do errands, like pitstops at the Dept of Labor, NY Public Library to work on resumes, and FedEx Kinko's. But, besides the mundane, apparently, they get to have some fun, like Pop Tarts and Ben Affleck! So what's in the space? Well, ya'll know how I love swag? They have superdupercute PT stuff to choose from! And, they have a whole sweets shoppe in the back! And, you can design your own Pop Tarts shirt! Dudes, they had like four other magnets to choose from, but I had to get this one...to stop me from buying the supercute tote bag with the same design. The second highlight of the day, was seeing a taping of The Daily Show. Mind you, I've probably seen five total episodes of the show...but we all know I love all that behind the scenes stuff. So, after waiting three hours (seriously, it was like Comic-Con all over again...only with old people, too), we finally went in. Had a really great first row, left of center seat, and a supercute cameraman workin' the flyover cam. Now, if you'll excuse me, I have to figure out if I want to run another errand. For some reason, I'm craving a Pop Tart. Or ten. Ok. Freaky. I went into Pop Tarts World at about 11:30 or so, by my count, a half-hour after its Grand Opening. Apparently, I missed the "big" announcement about the store on last night's VMAs. Of course, I'd be the only one in the world who stumbles into a grand opening. Heh. 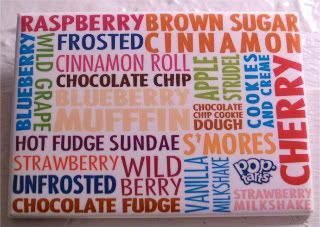 Of course, now I'm dying to know if I bought the first Pop Tarts magnet out of the store! 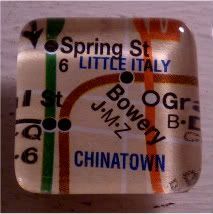 Another one of my tile magnets from the MTA. Love them. They're so little, and cute! And you know someone's making a mint from a really cute idea. Plus? Hello! Recycling of old Transit maps! Green! I've said it before, but I love this city's public transit system - yes, we're under budget cuts; yes, some of our bus stops are smelly and the trains can be unclean; yes, it's not air-conditioned. But, dudes, where else can you go anywhere in this city - anywhere in the five! boroughs! - for $2.50! Plus a transfer! Like, today, there was so much going on in town - and most of it free. It's why I love this town. The Brooklyn Book Festival would have been cool. Broadway on Broadway would have been fun, if not soggy. But today, I went back to the Paley Center, for their Fall TV previews, and of course, now have a few more shows to add to the dance card below. Superslim pickin's this year, I think, and I can't really figure out why. Possible additions emphasized below, based on yesterday's and today's screenings. And some shows look like they'll be relegated to online viewing, based on the latest TV Guide fall schedule. Sheesh. 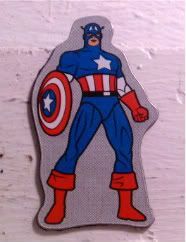 Another one of my newly rediscovered, should have used for Comic-Con, Marvel magnets. I had a whole post written out for this magnet, a pretty whiny one, but Stand Up 2 Cancer's on, and a Captain America magnet works for it, too. I love when the big networks get together and do simulbroadcasts for great causes. 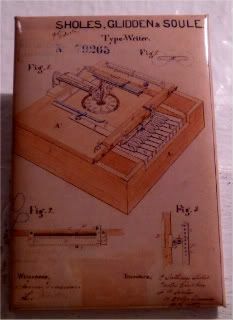 Another magnet from my National Archives patent set, it's the type writer patent from the 1800s. I never took typewriting in high school. Nope, my mother refused to let me give up one of my regular class periods in school for it, and she sent me to the Salisbury Business College during the summer for several of their classes, from Teen Typing to Word Processing. I remember the first class we took the classes on those old, very old, giant IBM Selectric typewriters, but when I moved up to the other computer classes, we were working on those old Radio Shack TRS-80s with 5.5" floppies. Whoa. And finally? This is how young I was...every session, we'd get a little break. And I loved running to the breakroom with whatever change I could scrounge from the house and buying some silly snack and drink out of the vending machines. I lived for those snack breaks! But, I have to hand it to my mother - those classes (like my 9th grade Home Ec class) served me well. I knew how to do straight-up admin work (business letter formatting, etc.) before I went to college, which meant I could work as an admin during school breaks. Plus, to this day, I can type like no one's business. Some could say it was the classes, but it could have been the 13 years of piano as well. *Well, what do you know. It IS where QWERTY comes from. Ya'll, I know I should have known that, but I didn't. Dang. So the best thing about roadtrips is the time you get to spend with yourself, thinking about things. While you're singing at the top of your lungs, you have almost no choice but to follow your every train of thought, which lets you explore certain feelings, relive certain memories, rethink certain conversations, and in general, think about yourself. Which sounds slightly selfish, I know, but ya'll know I'm right. I was struggling with a crossroads of moving to California or staying an East Coast girl, staying in my advertising job or moving into entertainment marketing. 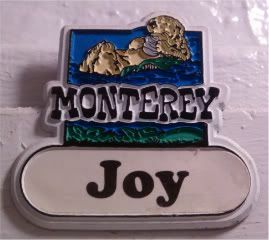 And that's where I picked up this Monterey magnet, somewhere between the corner of What if and Maybe. Today's been one of those days - even without a car, a roadtrip, or a CD (or 50). The NY State Department of Labor has this long list of careers seminars to help those on the job hunt, and today I attended three of them. First, can I just say, yay for the DOL for trying to help us? Second, very helpful! We went through three sessions - marketing yourself, networking, and then interviewing. And yes, a lot of it was common sense stuff, stuff that you can read on any website. But it's different when you're in a group of folks in the same situation, with someone completely objective assessing you and your skills. Plus, the instructor was dynamic and engaging, and even better, gave me a lot to think about. Stuff that I know I'm supposed to be thinking about but have managed to avoid over the last three weeks roadtripping with my parents. But stuff that I can no longer ignore. I can't wait to see where this crossroads leads! Oh! And, in a show of how small this world truly, truly is. The instructor used to work at the same company I did...and knew at least one person that I know. Freaky! This is one of my favorite images of Florence - ever. 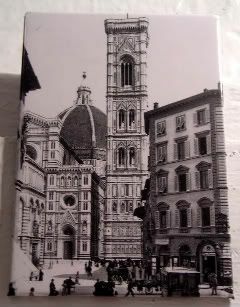 I think the reason why, is because Il Duomo and its Campanile was built between the 1200s and the 1400s, and still, more than 600 years later, I can take the very same picture - without meaning to! I'm using it for a couple of reasons, first, because I finally went to go see The American, mostly set in the Italian countryside. Gravy, is my boyfriend George Clooney superduper pretty. But, definitely drink some coffee before you head into the theatre. Oh, even though I should have known it from the get-go, it was definitely not the action flick I was anticipating. It's quiet. It's tense. It's quiet. No. I mean, seriously, George's dialogue had to have been less than 10 pages overall. Even as he came off as a model for designer sunglasses and wardrobe, George was fabulous in it - there was definitely no sign of George playing George. The camera work is beautiful, and you can tell that the director is really a photographer. But ya'll know how I hate overdirected movies? This would be one of them. My biggest pet peeve with this movie. "Here. Look at this beautiful roadside with a car driving down the left side. This movie (not car commercial) is set here. Here. Look at this beautiful Italian countryside. This movie (not NatGeo photoshoot) is now set here. Here. Look at George look beautiful in this doorway. He's worried someone's after him. Here. Look at George. He looks really hot in sunglasses. You can't see his true thoughts." The other reason I picked Florence because I picked up a new favorite show called Art of the Heist - all about famous art heists through history. Pretty cool stuff. Like the guy who walked into the Louvre and walked out with the Mona Lisa, and tried to sell it back to the Uffizi in Florence three years later. Really? You didn't think they'd notice? 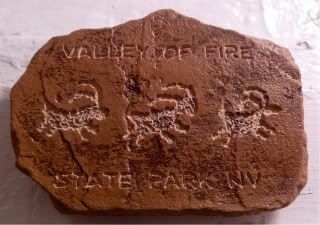 Or, how some family started forging masterpieces and selling them. And getting away with it! Or how the Hermitage in St. Petersburg did a standard inventory and found that more than 200 pieces in their collection were missing. Missing, I say! I swear, most of these stories are fodder for White Collar on USA. Even so, now, I'm now totally planning my trip to the Hermitage in 2012. Yes. 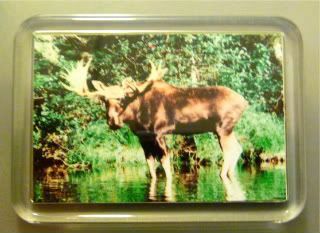 I totally bought this second magnet from that same gas station in Massachusetts. What? This guy was totally what I was looking for all up and down the Maine, New Hampshire and Vermont part of our roadtrip this week. What? It's not like they're joking when they put up those MOOSE CROSSING signs! Sigh. The Meese must be on the same evac plans that the Bears are on when I come rollin' through town. Quick! Joy's here, everyone! Stay outta sight! My dad has this funny joke that he uses whenever he gets a chance. When we went to London, he wanted to drop by Buckingham Palace, to say hi to Liz. When people visited DC, he sent his regards to Bill or George. 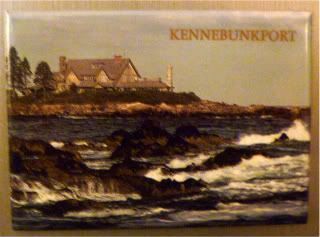 And so, today, it made sense that when we stumbled into Kennebunkport on our way to Portland, that my dad would want to visit George, even from across the inlet. I honestly didn't believe that's what this house was, the Bush's cottage getaway, even as half a dozen other tourists stood at our same vantage point. But, that's what it was, and of course, now, we have the pictures to prove we said hello.